The big day is tomorrow. 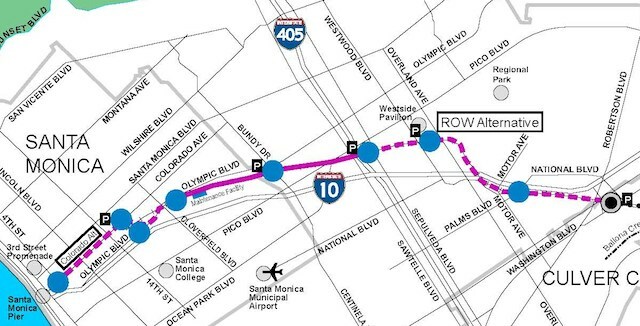 The Expo Line&apos;s construction authority board is scheduled to vote on the second phase, which will bring the line from Culver City to Santa Monica (the first phase between downtown and Culver City is already under construction). The vote could go a variety of ways, including being voted down—meaning no train—to what&apos;s expected: the route as seen in the photo above. In his preview of the meeting, Damien Newtwon at Streetsblog LA rounds up what two groups—one for, one against—are saying in their latest e-mail blasts. "The report calls for all train crossings through our community to go at street level (at-grade), blocking traffic as often as every 2 ½ minutes, 22 hours a day at Overland, Westwood, Military and Sepulveda!" says detractors of rail line, Neighbors for Smart Rail. "The FEIR document is woefully deficient and the data is flawed - it should not be adopted!" Friends 4 Expo Transit are prepared for the opposition. "Its opponents, after failing to detour the line from its straight path to Santa Monica, now demand unprecedented special treatment for one neighborhood under the guise of 'Build it right or don't build it,'" they say. No matter, it appears the light rail line will be approved. "I intend to vote yes," wrote Count Supervisor Zev Yaroslavsky on his blog. "It’s significant to note that the overwhelming majority of the 9,000 comments received on the environmental impact report have been positive," he noted.